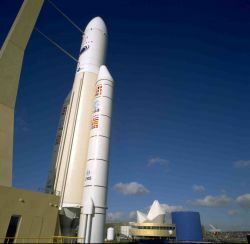 Get ready for the 2008 Toulouse Space Show! ENC-GNSS, EFTF 08, and more . . .
Next April’s Toulouse Space Show will provide a good deal of company for the European Navigation Conference (ENC-GNSS 2008). In addition to the annual European Frequency and Time Forum (EFTF 08), which joined ENC-GNSS 2007 this year at TimeNav ’07 in Geneva, Switzerland, events include a Space Applications symposium sponsored by the French space agency CNES, a commercial exhibition, and associated events for the general public, students, and young people, to promote the value of space applications in daily life. The trade exhibition will feature all aspects of space applications– from GNSS to agriculture to archaeology. The events take place April 22 to April 25, 2008 at the regional convention center, Centre de Congrès Pierre Baudis, near Place du Capitole in the Toulouse city center. Toulouse, in the southwest region of France, is a major center of the European civil aerospace industry, including construction of the Galileo and EGNOS systems. It is home to CNES Toulouse Space Center, Airbus, European Satellite Navigation Industries, SPOT Image, Thales Alenia Space, and EADS Astrium. Paper submission deadlines coming up in October and November 2007. Centre National d’Etudes spatiales (CNES) is organizing the Space Applications symposium to discuss earth observation space systems, telecommunications, and positioning and navigation applications. It follows up the first space applications colloquium held in Toulouse in December 2006. The SPACEAPLI 08 conference languages are English and French. Paper abstracts are due on November 15, 2007. Organized by the European Group of Institutes of Navigation (EUGIN) and the French Institution of Navigation (IFN), the ENC-GNSS 2008 will focus on the performance of the world’s GNSS systems, their space and ground segments, and new developments in mobile user equipment. The paper submission deadline is November 15, 2007.